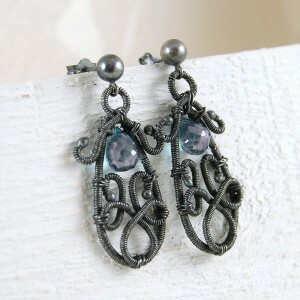 Sue loves to make wire wrapped jewellery and she has made another beautiful pair of Silver Wire Wrapped Earrings. The frame is all in one piece which she has hand forged into a pear shape to compliment the gemstone shape. She then tirelessly and carefully wrapped metres of silver wire around the frame and put her unique signature of coils spiralling up the stem of the ear wire. The frame was then oxidised then given a little light polish to brighten it up. The AAA Pink Mystic Quartz stone was then attached in the centre of the frame and sterling silver balls wrapped around the inside of the frame to enhance the design by having a contrast between oxidised and bright silver. Overall these earrings are stunning and are a great look for the summer as the Pink Mystic Quartz are absolutely sparkling. 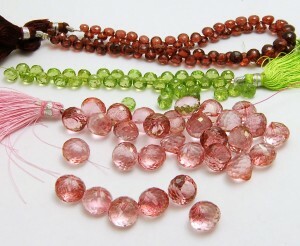 Woo hoo got my AAA gemstones today from America cannot wait to start designing some pieces with these beauties. I got these beautiful stones from a lovely website called www.rockcandybeadsllc.com you could just buy the whole shop. Jennifer who owns the shop has certain stones cut just for her which I think is brilliant because it gives her an edge over other gemstone sellers. Well worth a visit to get your brain ticking over with new designs just like I am right now thats why I bid you adieu because my lovely gemstones are calling for me. 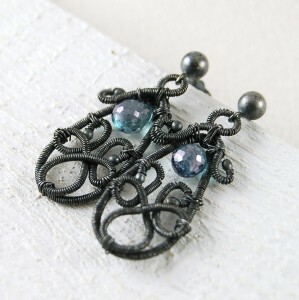 One of my latest designs are these beautiful oxidised sterling silver wire wrapped earrings as shown in the pictures. 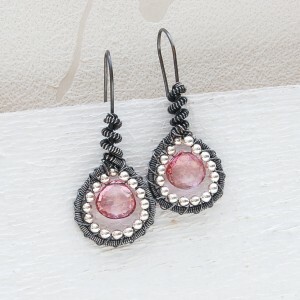 I love designing wire wrapped pieces as you can do so much with them and make it your own piece. 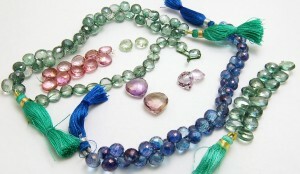 Iwanted to make a piece which was different and unique which is what IndiviJewels is all about and also to design a piece with these lovely AAA flawless Teal Blue Mystic Topaz faceted briolette drops that are absolutely stunning. I handmade the teardrop frame and then wire wrapped it and attached wire wrapped swirls on the inside of the teardrop then finished it off by making a loop for the ball stud to attach to but carried it down the teardrop a little way so as not to make it look too bereft at the top. I then oxidised them to highlight the wrapping. The earring size is 4cm approx long and 1.5cm at its widest point.